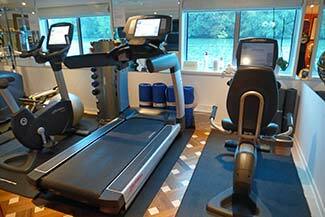 ABOVE: River Baroness has a fitness center with a view of the Seine. Oceangoing cruise ships often resemble self-contained floating resorts, with everything from Broadway-style entertainment to climbing walls or tennis courts. River vessels are different: They're more like boutique hotels that cruise from port to port, often staying overnight in towns or cities. And because more time is spent sightseeing than cruising, there's no need for the constant schedule of activities that you might expect on a Behemoth of the Seas or an Aquatic Princess. Spa. The Serenity River Spa offers massages, full-body treatments (such as "Full Body Honey Treatment with Peruvian Chocolate Exfoliation"), and more. On most days, the masseuse leads a free morning exercise session with basic zumba steps in the Monet Lounge. Wi-Fi. Free Wi-Fi Internet access is available throughout the ship. There are two Wi-Fi networks: an open "Gateway" network (no login required) in the Monet Lounge, and a "River Baroness" network in the cabins that requires an ID and password. The satellite connection can be painfully slow at times, and we had our best luck early in the morning or late at night in the Monet Lounge. Umbrellas. Full-size umbrellas are supplied in cabins and at the gangway. Bicycles and Nordic walking sticks. These are free to use, and they're available in ports where there's time for independent sightseeing.